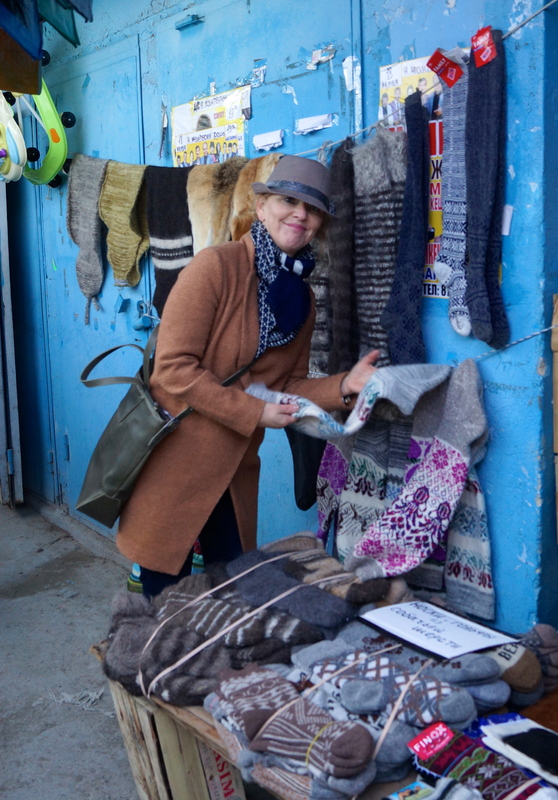 You’ll remember when I wrote my first dispatch from Kazakhstan I hoped for… “a labyrinth of streets and souks that come to life; exotic scenes, smells and intrigues.” I’m pleased to report that such markets are here in Aktau, at least three. They are lively, authentic and represent certain aspects of Eurasian culture and hospitality. 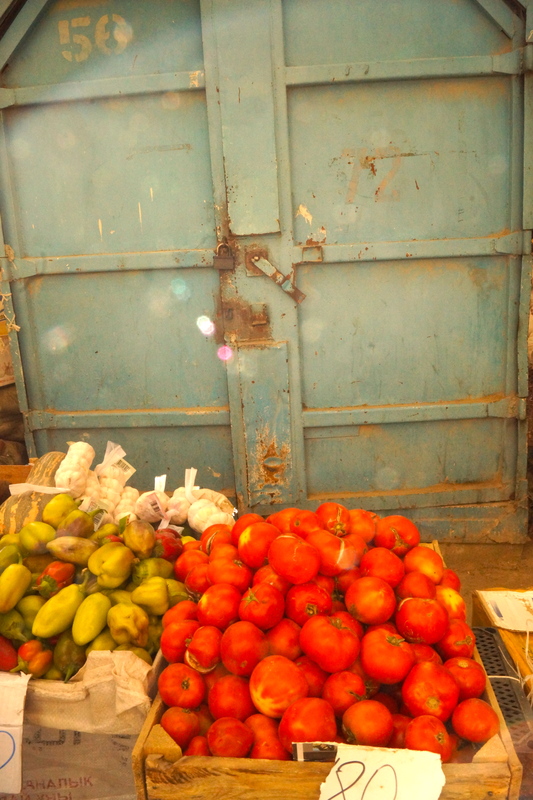 Is a market not a place that tells stories and allows glimpses into cultures? I believe that to be true and so I give you…. 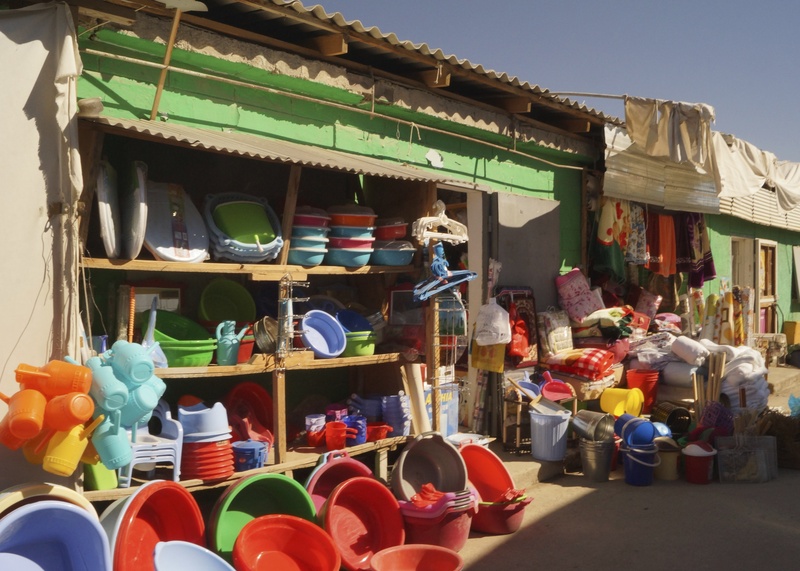 Three markets known for their meat, fruit, vegetables, spices, plastic goods, cheap clothes and more. 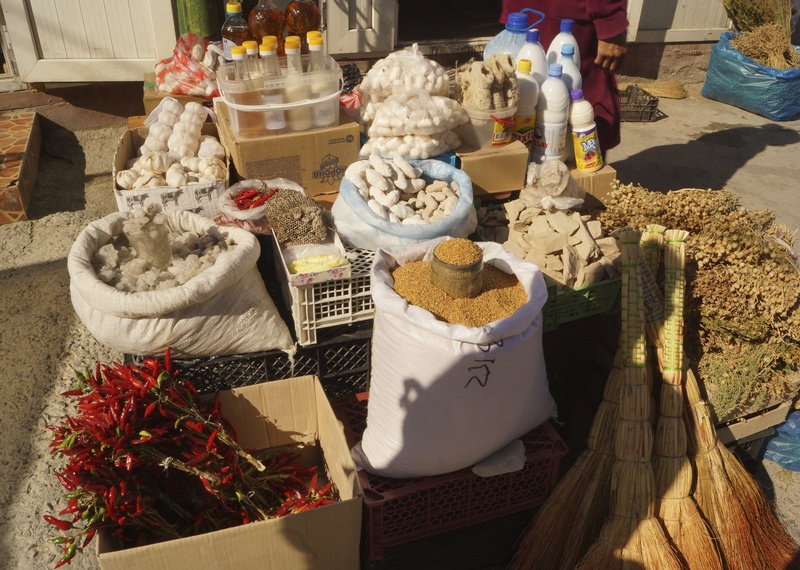 Markets, where many of the vendors are from other lands. 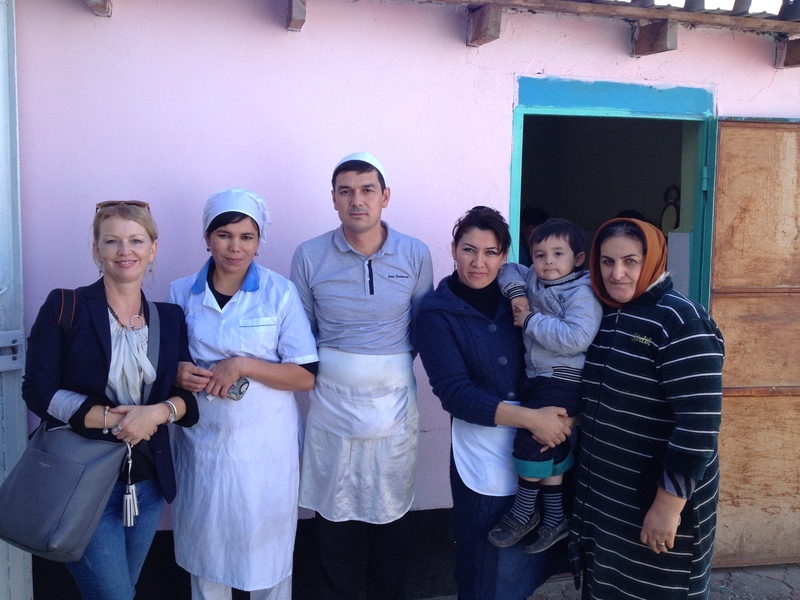 Home is Azerbaijan, Uzbekistan, Kyrgyzstan, Tajikistan; all those new Republics that were suddenly cut adrift from the Soviet Union, encountering unprecedented challenges in the years since. Some people have struggled, the next generation has found it easier. 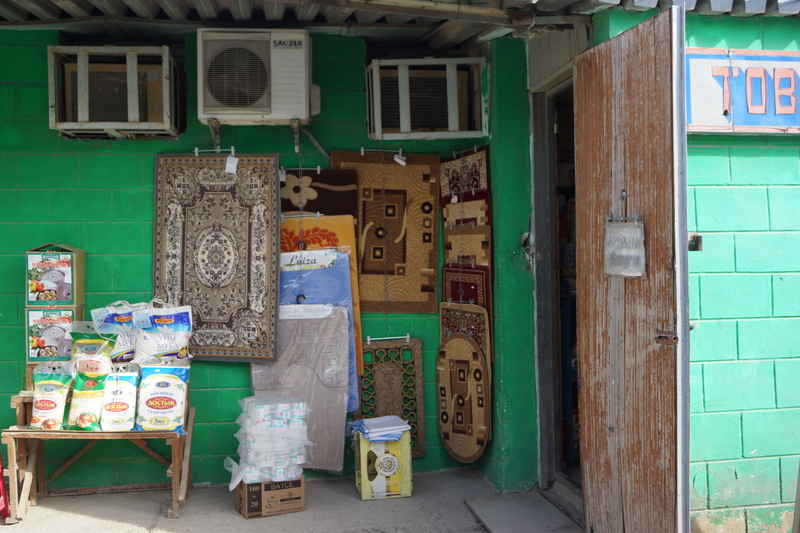 “Many poor people,” Samira, my Azeri friend tells me. We are at the small Volna Market, stalls and stores just off a busy, main street. 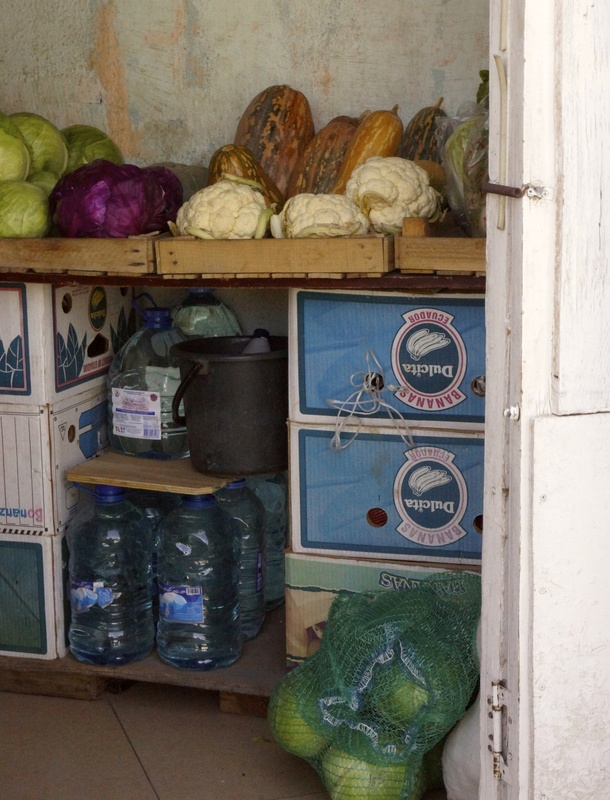 When the vendors discover that Samira is from Azerbaijan, she is surrounded. “Please send greetings back home,” they say wistfully…they are homesick. A lady with striking red lipstick and tidy blond hair wraps smoked fish then puts her hand to her heart. “I’m from Sakhalin, Russia,” she says, seeming lonely despite the bustle around her. Perhaps like many, she was sent here as a dissident, never finding her way back home. 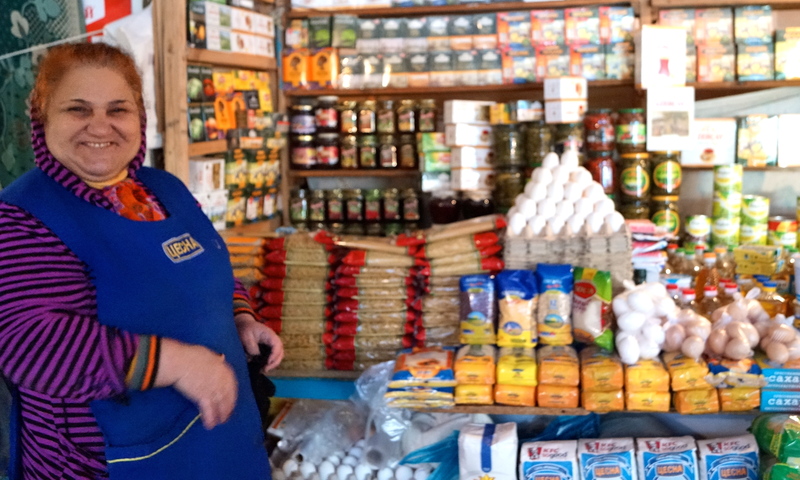 Eager for our attention, the vendor across the way gestures to her pyramid of eggs. I gladly buy some; she is ecstatic to have her photo taken, to have chatted with Samira in her native language. She pecks me on the cheek bidding farewell, pressing her jolly self against me for a friendly hug. Of course, being at the market with a ‘local’ is a different experience. Even our taxi driver has refused to leave us, now willingly laden with our purchases. He chuckles alongside the humourous Samira; I chide myself for not having kept up my Russian lessons. “Ah, Canada good, Ottawa?”…our capital they know. Yet on one occasion, we are thought to be suspicious and we’re followed, told brusquely to put the camera away. I comply until I’ve turned the corner. 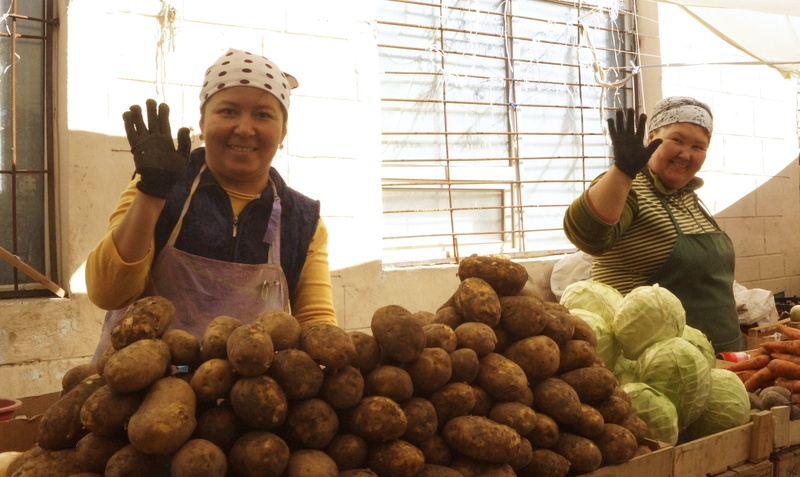 We buy produce that journeyed across the country by train, from the fertile region of Kazakhstan. 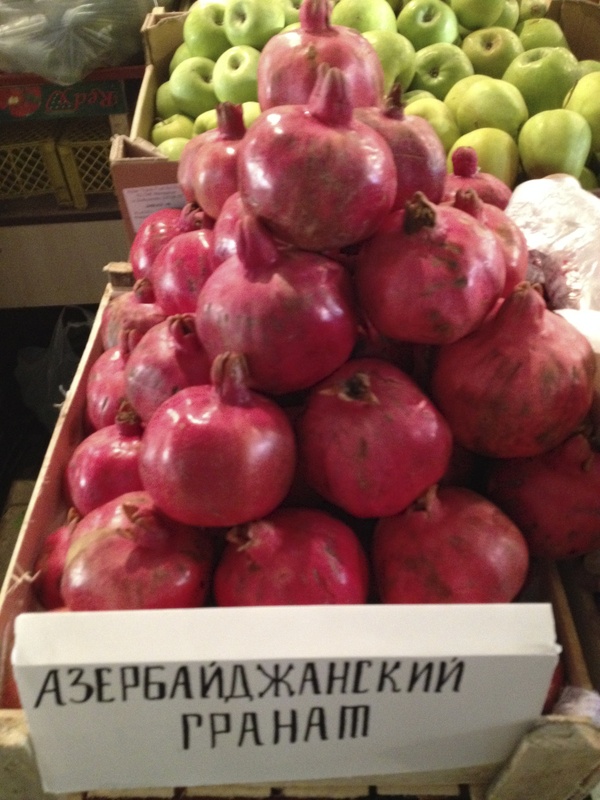 Staples such as apples from Almaty. This mountainous area in the Southern part of the country is the ancestral home of the apple…of all apples on earth, genetecists have recently confirmed. Many of the ‘greens’ arrive from across the Caspian, grown by the Azeris, the Georgians. The vegetables are plentiful but one day I’m refused service. I’m too choosy about the tomatoes I am selecting. The vendor shoos me away with a scowl, a holler and a flick of her hand. I’m offended until I ponder, Does her family have memories of the ‘hunger winters?‘ Those that starved; the fate of half of the Kazakh population in the winters of 1931-33…Stalin’s forced collectivization. I regret being picky about which tomatoes I was piling into my bag. Perhaps everyone should take some over-ripe and some firm, just thankful that there is food. 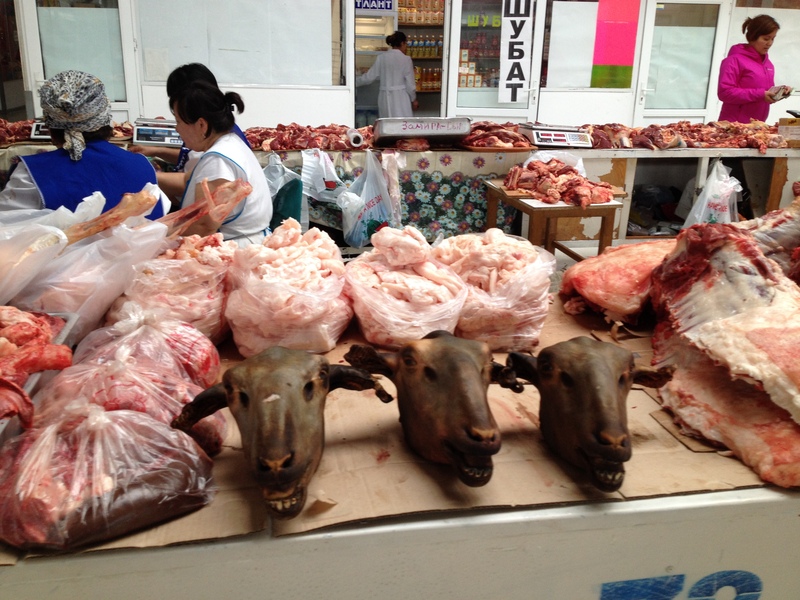 Meat is ample and readily available as Kazakh culture dictates. Here, they opine that chicken is merely a vegetable; sheep, beef and horse reign. Vital to any celebration, or dastarkhan, a sheep’s head is displayed and served first to the honoured guest. Then carved bit by bit; a piece of ear given to children, to be careful, to listen well. A smidgen of tongue to become more expressive. The eyes are delicacies, to seek wisdom. The brain, the best bit of all. Besbarmak is boiled meat served in large hunks. 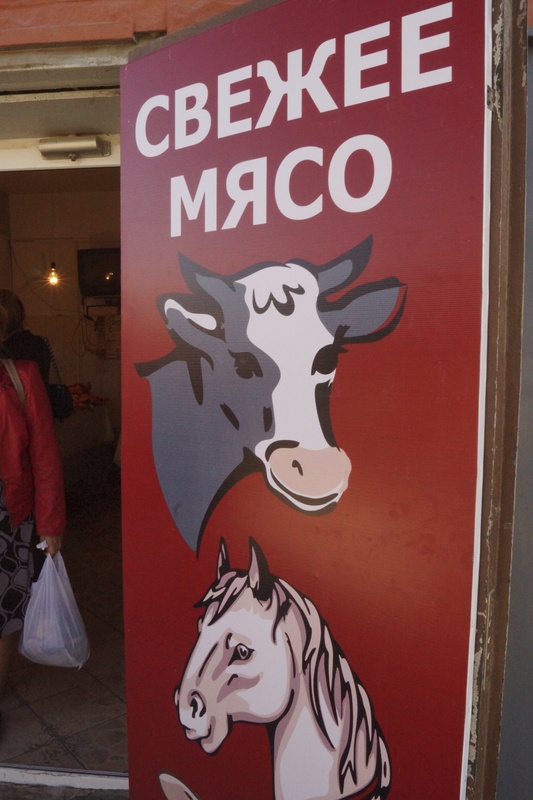 Shashlik is marinated meat on a stick, often eaten at roadside cafes. 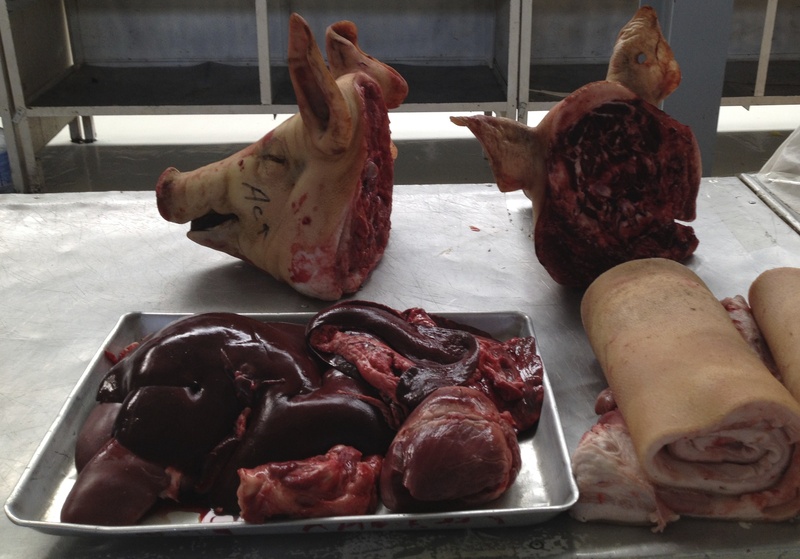 Ulpershek is a dish made from the heart, aorta, and fat of a horse. Prepared in a kettle, it’s often shared between sisters-in-law as a sign of unity. Kazy is a sausage eaten in the spring when a cow has a new calf, sometimes served with rice. Mypalau is a dish made from sheep’s brain. Put the brain in a wooden bowl, add marrow, pieces of meat, salted fat in broth and garlic. On and on, go the meat recipes. 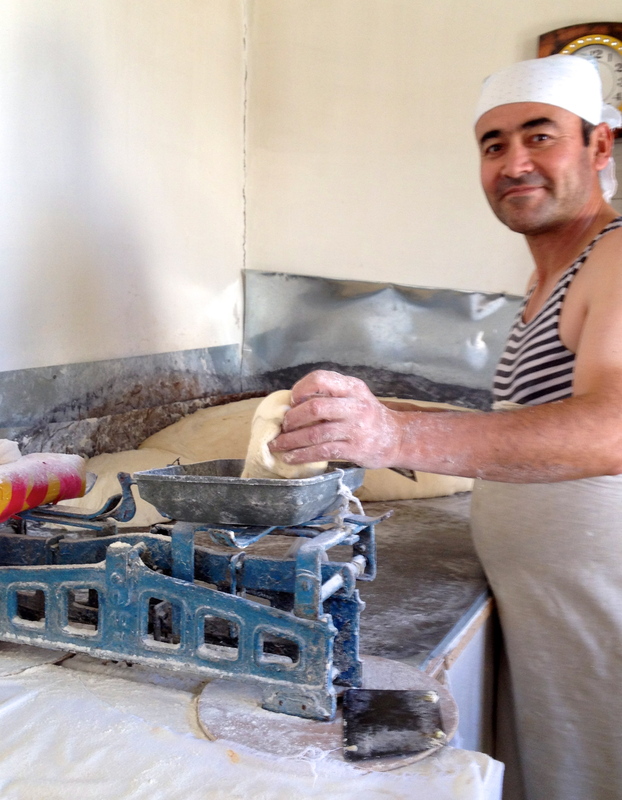 One doesn’t actually see much bread at these markets, but we peek into a naan bakery. The scent of fresh baking from the tandoor enticing us to enter. The baker poses proudly while I openly covet his old, weighty scale. In our market visits, I had been intrigued by white, stone-like pieces that are displayed amongst spices, pulses and grains. Imprinted with knuckle-marks, they have a haunting story to tell. Local villagers, risking their own lives, secretly tried to ease the prisoners’ hunger by throwing ‘stones’ at them. The guards delighted in this…’even your own kind throw stones at you!’ But the ‘rocks’ were actually hand formed, dessicated pieces of cheese curd, kurt. To this day, they are reminders of the repugnant man-made hells and of thousands of lost, innocent lives. When I see kurt in the markets, I am reminded of my Dutch grandmother’s own wartime experiences. 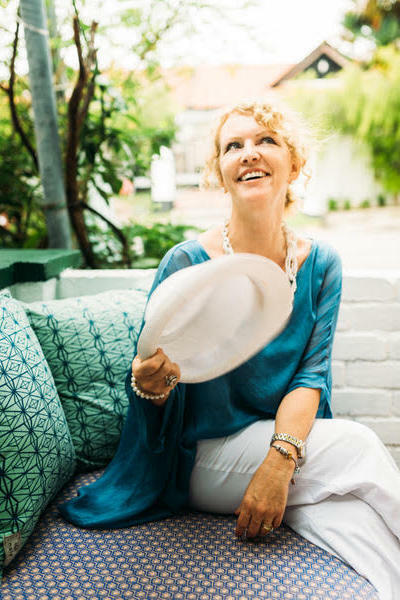 She would tell us sternly, yet lovingly, that ‘alles moet op’…you must eat everything on your plate. On a chilly day a few months ago, it wasn’t food that I bought at the market, but something to warm me. Two things in fact, both reminding of my stoic grandmother. First, a cozy pair of knitted socks, crafted by women prisoners…from dog hair. I remember my grandmother often knitting or crocheting. Through her life she also embodied resourcefulness; drawing from her frugal upbringing, from raising children during the Second World War, to the harsh realities of being new immigrants in Canada. Across the alley, a welcoming lady nods to her wares; she has crocheted slippers. They are just as my grandmother had made for me. I remember choosing the colour of Phentex I wanted; they are long since frayed and worn. I take my time deciding on a pair, thinking of Margje, knowing she’d be amused at finding ‘her slippers’ in such a faraway place. And the story of the kurt would have resonated with her, having suffered through her own ‘hunger winters.’ I think of her, and of all the ladies whose own trials are etched on their faces. I can’t hear all of their stories, but I can look into their eyes with sincerity and a smile…I can make contact. There is no language barrier to that.